One of the best ways to experience Advent this year is to join Dr. Tim Gray for the first talk of the Archbishop’s Year of Faith Lecture Series. I’ve known Dr. Gray for many years as one of the finest young biblical scholars in North America – articulate, vividly engaging, and rich in the history and meaning of God’s Word. Scheduled for St. Charles Borromeo Seminary on Thursday evening, December 13, and designed for the general public, Dr. Gray’s theme is “Advent: A Season of Hope.” He’s the right man with the right theme at the right time, and I strongly encourage Catholics across the archdiocese to spend the $5 admission to hear and share his message. We’ve never needed it more. More than 50 years ago, C.S. Lewis published an ironic little essay called, “Xmas and Christmas: A Lost Chapter from Herodotus.” In it, he reverses the letters of his home country, “Britain.” Then he writes about the strange winter customs of a barbarian nation called Niatirb. It’s worth reading in these early days of Advent. I’ll share with you just one passage. “In the middle of winter when fogs and rains most abound, [the Niatirbians] have a great festival called Exmas, and for 50 days they prepare for it in the manner which is called, in their barbarian speech, the Exmas Rush. “When the day of the festival comes, most of the citizens, being exhausted from the [frenzies of the] Rush, lie in bed till noon. But in the evening they eat five times as much as on other days, and crowning themselves with crowns of paper, they become intoxicated. And on the day after Exmas, they are very grave, being internally disordered by the supper and the drinking and the reckoning of how much they have spent on gifts and on the wine. “[Now a] few among the Niatirbians have also a festival, separate and to themselves, called Crissmas, which is on the same day as Exmas. And those who keep Crissmas, doing the opposite to the majority of Niatirbians, rise early on that day with shining faces and go before sunrise to certain temples where they partake of a sacred feast. What Lewis wrote about in Britain more than half a century ago is increasingly true about our own country today. As we begin our annual pilgrimage through Advent to the birth of Jesus, what will we do to really live this sacred season? The world has an ingenious ability to attach itself to what Christians believe; tame it; subvert it — and then turn it against the very people who continue to believe. Too many Americans don’t really celebrate Christmas. They may think they do, but they don’t. They celebrate Exmas. The world — left to its own devices — has no room and no use for the birth of Jesus Christ. It has contempt for Christians who seriously strive to be his disciples. So we have nothing to lose and everything to gain by being the saints God intended us to be. We can at least seek to be holy by tithing our time to sit quietly with God; allowing him to fill our actions and our choices with his Son; and letting him shape us into the men and women he needs. We can get up and experience the dawn in silence on these December mornings as a reminder of what Advent and Christmas mean. We can prepare ourselves to be alert for the voice of God and to receive God’s word afresh and proclaim it anew. Advent means “coming.” What’s coming in the reality of Christmas is an invasion. The world needs the invasion but doesn’t want it. It’s an invasion of human flesh and of all creation by the Son of God; by the holiness of the Creator himself. All of us in the Church were baptized to be part of that good invasion. The doubts, the failures and the mistakes of the past don’t ultimately matter. Only our choices now matter. How will we live our Christian faith from this day forward? How will we make our Catholic witness an icon of Christ’s Advent? For our own sake, and the sake of the people we hold dear, we need to pray that our love for God and for the suffering and needy persons around us, will truly reflect God’s love for us. And when it does, then the world will be a different place. 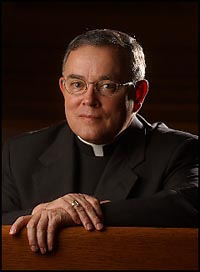 Register for Dr. Gray’s lecture online at http://archphila.org/yearoffaith. Or for more information, kindly contact Meghan Cokeley at 215.587.0500 or at mcokeley@adphila.org. C S. Lewis is a man who truly understood our Catholic faith.